This is no one’s idea of a personal blog, but when your ever-lovin’ ed-otter turned 47 yesterday he received two books from his family that are so cool and so furry that he just had to give mention to them — again. Both of them feature behind-the-scenes looks at recent Dreamworks Animation films, and both of them are available now (here and here) in hardcover from Insight Editions. 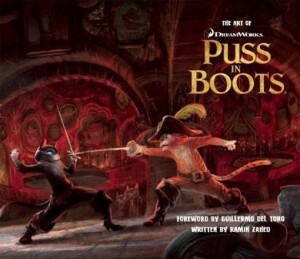 The Art of Puss in Boots is edited by Ramin Zahed (veteran editor of Animation Magazine) with a forward by famous director Guillermo Del Toro. The Art of Kung Fu Panda 2 is edited by Tracy Miller-Zarneke (who worked on numerous animated films including Chicken Little and The Emperor’s New Groove) with a forward by famous actor Dustin Hoffman (aka Master Shifu). Both books feature so much background artwork and character development for these two very furry films that the reader may find themselves wondering which are more interesting: The final character designs or the sketches leading up to them.